For many people, cats fall into the same category as potato chips: it is impossible to have just one. Multi-cat households are incredibly common, and while many times this arrangement is natural and smooth, there are just as many situations in which things could potentially go wrong between cats that share a home. It is important for owners of multiple cats to recognize that owning multiple cats is a big commitment; they must recognize the behaviors of both or all of their cats, and they need to make the home comfortable for all the felines who live there. Perhaps the most important thing that many multi-cat owners forget to consider is the number of litter boxes they have in their home. If the cats in a home also go outside, this is a little less important, but for our lovely indoor felines, this is key. There should always be one litter box in the house per cat living there, plus one. This means that if you have two cats, there should be three litter boxes in your home. They should not all be in the same location, and it is important to place them in areas where cats will be happy to go. If the litter boxes are in a cold basement or a drafty garage, they will be less than thrilled to use them. The spacing of the bedding in the house is almost as important as the number and location of commodes. Cats should have plenty of comfortable places to hide and sleep, and with multiple cats in one home, it is very important to provide them with a number of bed areas so that they can each be comfortable on their own. If there is only one cat-friendly bed in the home, then one of the cats will likely claim it as their own. Multiple areas of comfortable bedding prevent this from happening. Individuality is something that all owners should keep in mind when taking care of their cats. Each cat will have its own personality and preferences, and they cannot all be given the same manner of treatment. While some cats are affectionate and like to be held, others are spitfires who prefer energetic playtime. For owners with multiple cats, spending time with each feline individually is important. Not only will this strengthen the bond that the owner has with the cat, but it will also teach the cats that they do not have to compete with each other. Do you own multiple cats? How does it work for you? 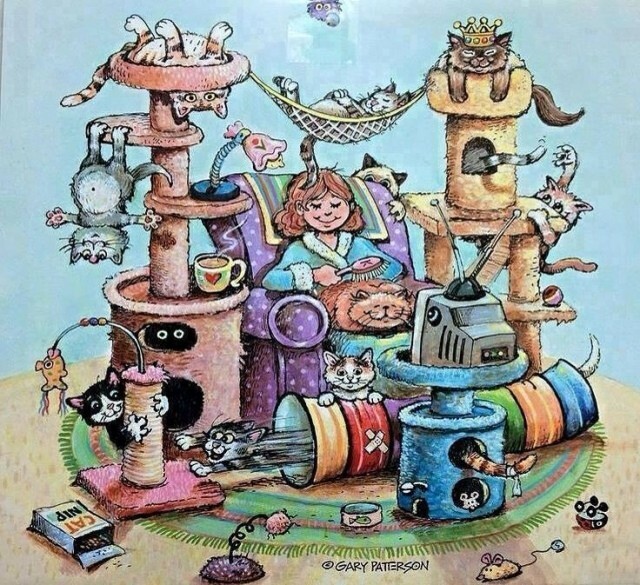 Tell us about any problems you’ve encountered and the joys you’ve experienced from owning more than one kitty. We share our home with 10 strictly indoor felines. Was 11 but the 19 year old crossed the RB 5 months ago. Our furbbies are ages 2 thru 8. All but 1 are rescues or fosters that ended up finding their 4-ever home with us rather than a short life in a cage in a “shelter”. Like any large family there are occasional spats but there is always lots of love and we are all fat, sassy, healthy and happy tho I am always broke. But that’s ok cuz spending my money on my cats is what I want to do. I also provide a majority of the care for a semi-feral colony of a dozen. TY for your kind words. Many say “oh, crazy cat lady” or you should spend your money on food for hungry or homeless or a church. Well, this is my family and my charity $$$ goes to hungry, homeless kitties. AS for the churches, no comment there and no insult intended if I offend there. Different personalities, likes & dislikes but love the kittez!!! Oh, and we also got a rescued African Grey parrot. People wonder how they’re all such good friends and my reply is that they just have no choice – they get used to each other. My only regret is I can’t adopt more – so I sign petitions, hoping to help make a difference (sometimes we succeed). SA, you have already made a difference, several times over!